I am so excited to share this project with you guys today. This was definitely the showstopper from Blake’s Boho still Boyish and Beachy Bedroom Makeover and It is one of those that looks really complicated or like you need to have a special skill in painting to get this right, but you do not, I assure you. I know this because I redid this dang wall 189 times just to be sure that someone who has never done any painting, artistic or otherwise, could still absolutely do this project! My first 188 attempts didn’t work. Or at least they didn’t end up resulting in something that was easily reproduced and so… they didn’t work. – 2 – 2″ paint brushes – short bristle is easier to work with, flat angle (not angled), light weight is a good idea. – dark color paint – I used a dark indigo color, you can use any color you like. – white or light color paint – if your walls are builder grade white you can use your wall color, otherwise just use a white or something close to it. – easy hold paint container – similar to the one you see pictured below. This will help tremendously, though it isn’t a requirement obviously. Each stage pictured in the following steps will be a mixture of your colored paint, white paint and water in varying amounts but the process will be the same all the way through, only your placement will change along with your formula. Easy peasy. Our first step requires a 1:2:1/2 ratio of color to white to water with half the amount of your color to the amount of white and half of that still in water. You need a decent amount of product for this step so you can start with something like 1/4 cup of your colored paint, 1/2 cup of white and an 1/8 cup of water. You will work about 2/3’s of the way up your wall and the total area you cover will be about 2 feet in height for the majority of the paint application and a few scattered swirls will fall in the foot above and the 2 feet below this strip of swirls. We are going to be using a circular swirling motion for every single step of this project. For this step you will swirl your brush into a circle that is approximately 4 inches in size like you see above. They don’t need to be perfect, in fact this will be better in the end if they aren’t and have some white showing through or if you can see your brush strokes. If you find your paint to be a bit to thick to easily make the circles, just add a few more drops until it’s easy to swirl it on, but doesn’t run or drip when you apply it. ** This is very important. Drips will be a problem during any of the steps that have colored paint so make sure your formula is never too runny that you have drips. You will continue making your circles all the way around your room in a section that is 2 feet high and scattered as you see in the first image above. Once you finish doing this you will follow it up by filling in the white space for the middle portion of your section with a slightly concentrated number of circles that overlap like you see in the second image above. It’s easier to do this in two steps so that you don’t have a solid 2 foot section and instead end up with the middle being more concentrated than the top and bottom of this section. I learned this the hard way. For this next step you are going to use a formula of 1:6:1 with 1 part colored paint, 6 parts white paint and 1 part water. This will be a much lighter concoction that you will sprinkle over the top of your section in a scattered very spaced out manner. Then you will pull this color down below your section and place your swirls in a very scattered pattern that runs about 2 feet below your section. Once you do that you will also scatter this color above your section sporadically, about a foot above your section. While this step might seem counterintuitive, I promise it will be important for helping you get that watercolor look later without using watercolors or knowing how to paint, so just go with me on this. 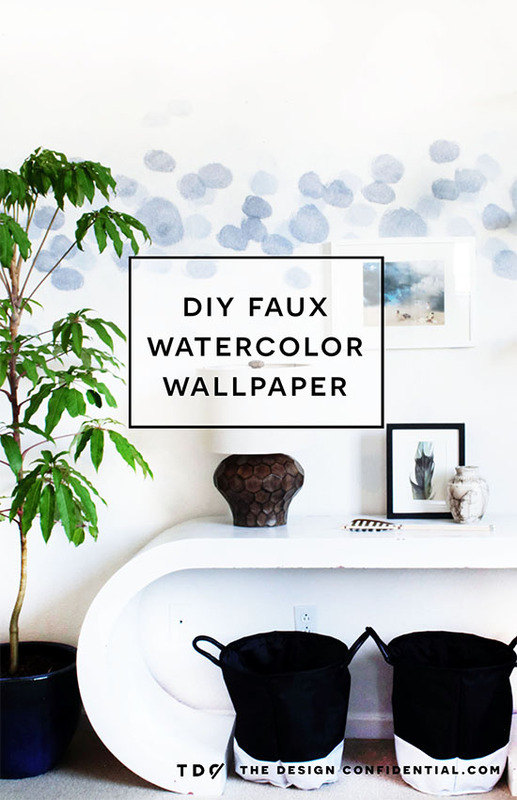 You will need a mixture of 1:1 white paint to water. This should be about the color of milk but not quite as runny, though not much more thick. You don’t want to be painting for this step, you will want to be washing, which means when you apply this it will be see-through a bit but will wash out the color your applied so you will need to judge your consistency by testing in a discreet area. You are going to keep on swirling and essentially swirl right on over the top of everything you just painted. This includes all of the scattered circles above and below. You want to wash out the color quite a bit so you are left with a milk mess of something that used to a paint project. It will look cray for just a bit. Don’t worry. If your paint is too thick and it actually just blocks out the color you applied in the previous steps, completely, just add a few more drops of water at a time until it’s not so thick. You can use a bit of water over the top of your test spot to ‘undo’ your test spot so that it isn’t different from the other areas of your project. Now we will go right over the top of our original scatter section only in a more sporadic way using a formula of 1:1:1 ratio of colored paint, white paint and water. You want this to be easy to apply and a bit see-through-ish as you swirl, but not runny or drippy. Your circles will be spread out and you can do just a few that sit above the top of your section and a few that sit below it as well. Sparse is the name of the game here, you can always build, but less is definitely more. For the final bit of color before the final step, you will want a ratio of 1:1/2-1 of colored paint to water. You will not use any white paint for this step, only the color itself watered down. This will make it runny to the point where your color is see through even in your paint pan. When you apply your swirls for this step you will need to put your color on your brush and then wring your brush out so that when you actually put it on the wall it’s watery, but doesn’t run. You can wring your brush out by pressing it against the sides of your container until most of the wetness runs out. If it is still coming out of your brush when you push it agains the side of your container, then it’s probably going to cause drips… very dark drips. This isn’t a project you can touch up very easily so I warn you against getting sloppy here. You are going to apply this layer in small and larger circles that overlap the previous layer and are more frequent than the previous layer, but are still sporadic. Woot woot! Your arm is probably very tired after all this swirling and whirling around your space. Mine was, especially since I did this project over and over again. Also, I learned you can actually wear the bristles on your brush down into a nub if you work it like this for an extended period of time… who knew? So for your final step we are going to create a wash again, similar to our wash earlier in this project, only this time it will be more runny and much more watery. Use a formula of 1:2 white paint to water and adjust until it looks like watered down milk. It won’t matter quite that much if you have drips of this since it’s white, but to avoid drips, wring your brush as in the previous step, and then apply covering the entire area you have painted. It will look like the image above after you apply your wash. You can see that the colors aren’t saturated and look as though they have been painted over with a bit of milky water. You can also now see all the layers come together into what looks like an entirely watercolor application, and why you did the first several steps as the colors blend a bit and water down into this beauty! Yahoo! It gives you the look of blending with only the need to apply layer after layer of circles one on top of the next.